Alistair MacLeod is a master of his craft, an exceptional and original voice. His writing is sometimes described as elegiac and it is, in the sense that he turns his eye with acutely telling effect on history, particularly the history of the Highland migration to Canada. But his writing is also immediate and sometimes breathtaking in the way it captures contemporary experience. 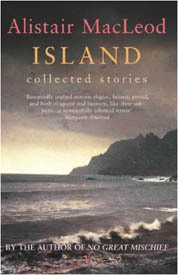 His short stories were included in The Modern Library: The 200 Best Novels in English Since 1900, and have been reprinted in a collected edition, Island, published in Canada. 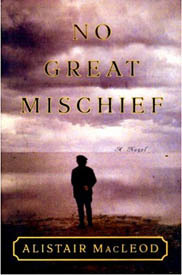 No Great Mischief tells the story of a Cape Breton family through the eyes of Alexander Macdonald whose career as an orthodontist has taken him away from the relatively isolated community he grew up in and into urban life. The ironic title of the novel is taken from General Wolfe’s notorious remark made in 1759 on sending Highlanders to scale the Heights of Quebec – that it would be no great mischief if they fall. Near the beginning of the novel, there is a fatal accident as Alexander Macdonald’s parents and older brother are walking over the ice back to the lighthouse where they stay. Did you use the image of the lighthouse to represent trust, or misplaced trust? The lighthouse is an ambiguous image. Its function is to say Stay away, don’t come here, this is where the rocks are! But if by some circumstance sailors do wash up on the rocks, then the lighthouse says Come here, because there will be fire and food and shelter. In today’s world where the lighthouses are automatic and there are no keepers any more, it’s somewhat different. Among other things the book is an exploration of trust in leaders. It’s too simple to say that if you always follow the rules and do the right thing, you will be saved, because very often you’re not. The Highlanders followed Wolfe’s order because he was their leader, but was their trust misplaced? Should the Macdonalds have followed their leaders into battle at Culloden? Should Americans have followed their leaders into the Vietnam War? Sometimes leaders know what they’re doing and sometimes they lead their followers to disaster. The novel describes how, despite their shared culture and language, Gaels ended up as antagonists on different sides in the American Revolution. Gaelic songs from that period express many points of view, in fact people on opposite sides in the conflict actually used these songs to persuade each other to change sides. Flora Macdonald, who supported the British side, was seen as a heroine or a traitor, depending on who told the story. Sometimes people fought for causes they really believed in, sometimes for causes they didn’t believe in; sometimes as regular soldiers and sometimes as mercenaries. The business of war runs through No Great Mischief. I was wondering about your own relationship to the Gaelic language. Do you speak it yourself? Never well. My wife speaks and reads and writes it, and we come from the same community. We grew up three miles from one another. But in her house there were unilingual Gaelic speakers for longer than there were in mine. It was my grandparents’ and my parents’ first language, but what I have are smidgens. I know the songs because I’ve heard them so much. I know them in the way an illiterate person would know them. You just learn them by osmosis, and it’s strange when you see them written down. As long as Scots emigrants remained a rural people in fairly isolated communities and there was nobody else to integrate with, they carried on speaking Gaelic. At one time there were more Gaelic-speakers in Canada than there were in the Scottish Highlands. But after the Second World War people began to move around more and English was seen as the language of progress. You had to speak English if you wanted to get a job. Now there are a lot of families in Canada with Highland names who are totally French-speaking, and have been for generations. In some areas, especially Quebec, you encounter French-speaking people with names like Robert Mackenzie. There’s a reference in the novel to Gaelic as a dead language lurking in the ventricles of the heart. That’s a quote I use from a Canadian writer, Margaret Lawrence. One of her characters plays ‘Morag of Dunvegan’, over and over and although she doesn’t understand the Gaelic, the song has some kind of resonance with her being. Similarly in No Great Mischief, Alexander’s twin sister is surprised to find that when people speak Gaelic to her she understands it, though she’s been away from it for a long time. This somehow connects with the idea in the novel of having to work with what we’re given. When you’re a child you have no control over what’s given to you, then as you approach adulthood you become capable of changing your life to a certain extent. You may move away from your upbringing, but I think it’s always within you and probably colours the way you live. Alexander’s grandparents are powerful forces in his life, but they represent very different approaches. One grandmother seems to have a phrase for every occasion. The grandmother has a hold over the children – she’s always saying if I hadn’t looked after my own blood, where would you be now?, and this is a scary thought, because they could be shipped off to an orphanage or something. Other favourite sayings are Everyone should make their own bed, it’ll prepare you for life, and a penny saved is a penny earned and she drums all this into the children’s heads. When her grand-daughter decides to become an actress, her response is, Why would anybody want to be a different person every night? Why don’t you just be yourself? She thinks of acting as frivolous. Her husband is a more theoretical person and always questioning things, because, being illegitimate, he was not born into a happy situation. This was not a good thing at that time for either the mother or the child. His mother always slapped him across the face when he asked questions about his father, and he is haunted by what his father would have been like. When he looks in the mirror he tries to imagine how his father would have looked, rather than looking at his own reflection. He has no past on that side, and he’s trying to figure out where he came from. This question broadens out into where do we all come from?, and he starts looking into Scottish history, always on a quest for certainty. He dies with his glasses on his nose, reading yet another book on the history of the Scottish clans. What do you think is your own social responsibility as a writer? I suppose I see myself as a kind of witness for a certain type of people and a certain way of life. But I hesitate to say that, because it sounds so pompous! People sometimes say to me You’re the voice of Cape Breton, and I think, Jeez, I don’t want to be the voice of Cape Breton! I think a writer’s relationship with his or her subject-matter is like being in love. Somebody could say to me You should write a novel about Los Angeles, but that would be like saying There are lots of girls you could fall in love with in New York: I don’t want to fall in love with girls in New York. I’m never going to write a novel about Los Angeles. As a writer, you should follow your heart. You should write about what you love. I don’t think that ‘Writer A’ lusts after the material of ‘Writer B’. Emily Brontë couldn’t have set Wuthering Heights in downtown London! I don’t think she would have wanted to write like Charles Dickens, and Dickens wouldn’t have wanted to write like D.H. Lawrence. Good writers are grounded in their own environment. Your short stories are usually about people living in quite harsh rural environments. But you also have the transition in your novel of a new generation living in big soft cities. Some scenes, where I describe the orthodontist’s house, show it to be a posh, nice place to live. But other scenes are set in all-male, run-down rooming houses full of old drunk men. They’re there in every city, where people just subsist from one week to the next. That’s another kind of city life. People go to cities for different reasons; the orthodontist goes to become rich, whereas others go there because you can get a room for £2 a week. Why did you choose to write about an orthodontist? Orthodontistry changes people on the outside but doesn’t do anything to their inside. Behind the smile, not much changes. A couple of years ago I was reading an article in Harper’s magazine on ‘The Invention of Disease’. It was about modern ‘diseases’ like male baldness. Men have always gone bald, but now you can get hair transplants; for $20,000 your hair can be restored. It’s like having crooked teeth; they can now be straightened. These are diseases of wealth. No one else in Alexander’s family was in orthodontistry. He comes from a family where horses used to pull out bad teeth! But certain professions do run in families. People sometimes ask me, Was your father a bard? There’s this idea that you can’t write if your parents or grandparents weren’t writers. There is certainly a bardic feel to your work. Well, I do read all the sentences aloud and I like to give them musicality and rhythm. As a writer I like to say something well, giving melody to the lyrics. You really seem to get under the skin of the people you are writing about. Somebody once said of Tennyson that although he created a gallery of people, he never seemed to get into their skins, only into their shoes. So I have that in my mind when I’m writing and things aren’t going well. I think, I’m only getting into the shoes of this person. Were there any books you particularly enjoyed as a child? I find it hard to answer this question. People are always asking me what I’ve read that’s influenced me. But I can’t say I read The Heart of Midlothian and it changed my life forever. Have you read my short story, ‘The Boat’? There’s a woman in that who only ever read one book in her life - Ivanhoe – and she decided never to read another book again! I’ve always read books, and I like to read, but when somebody says Who do you think is a major British or American writer today?, my eyes kind of glaze over. I have difficulty thinking in those terms.